Grado is one of the prettiest and most quaint towns in northern Italy. This small fishing village on Friuli’s Adriatic coast brings together elements of Venetian architecture in its narrow, winding streets with an active beach life that naturally hits its peak during the summer months. The town center is a pedestrian-only zone, making Grado a great place for families with small children. Located just off the main church, Tavernetta all’Androna remains the best place to enjoy the numerous bounties of the Adriatic. 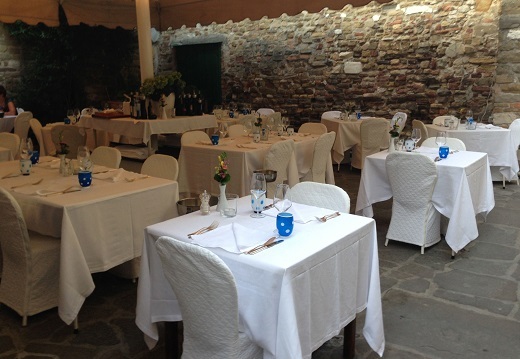 The outdoor terrace is also one of the most beautiful spots in Italy. 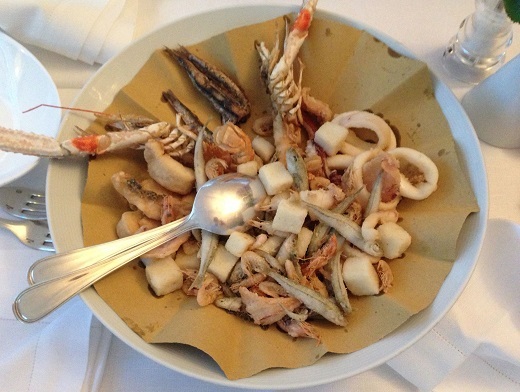 Fritto misto is a staple, and few do it better than all’Adrona. Cubes of fried white polenta complement the fried calamari, shellfish, bianchetti and scampi. What a dish. 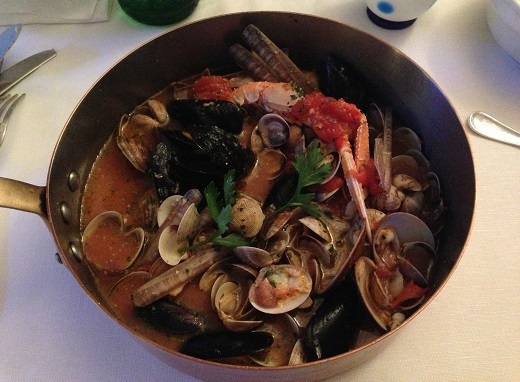 Androna’s flagship padellata, a sautée of clams, mussels, scallops, razor clams and scallops, is simply one of the very finest dishes readers will enjoy anywhere in Italy. Enough for a meal on its own, the padellata is generous and bursting with flavor. I never miss a chance to order it. 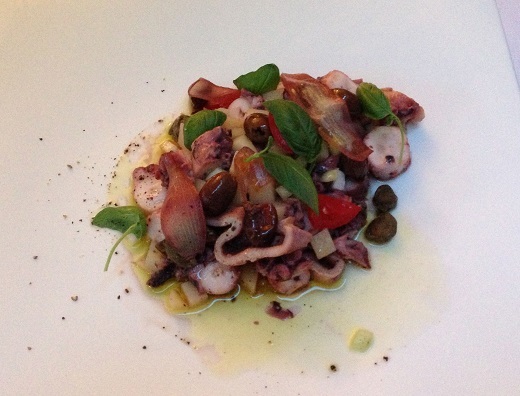 My other appetizer, the octopus salad, served slightly warm, is bursting with flavor. Fresh tomato and basil add brightness and a sense of summer luminosity that is impossible not to love. 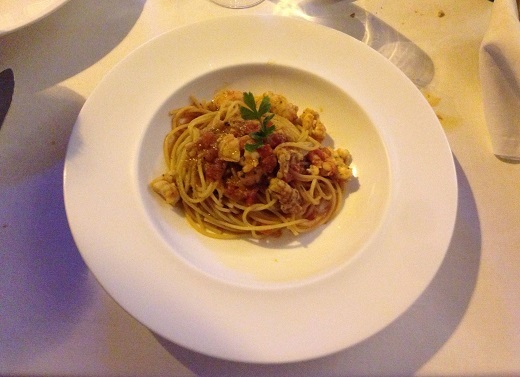 Our pasta course, spaghetti with shellfish Busara-style is also fabulous. The combination of perfectly cooked, briny, melt-in-your-mouth shellfish and al dente spaghetti is heavenly. Another beautifully executed dish, the spaghetti could be a meal on its own. A roasted whole orata tastes like the sea. It is fabulous. Serving whole fish tableside requires a certain amount of experience that is missing on this night, but the fish itself is delicious despite the sloppy presentation. 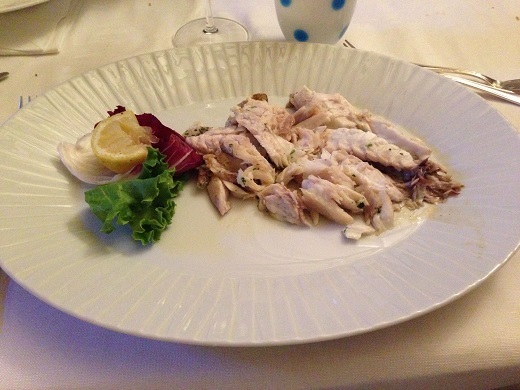 As good as the food is – and it is usually great – wine is turns out to be a disappointment at Androna. The wine list is encyclopedic in size and scope. Sadly, many of the selections are outdated. I watch as the table next to us carefully plans their food and wine pairings, only to be told that the wines they want aren’t available. The waiter basically tells the guests what they are going to drink. Are you kidding? What a mess. This level of service is unacceptable at any level, but in a high-end restaurant it is beyond the pale. Why not just have a smaller, focused list with 10-20 wines that are always available? 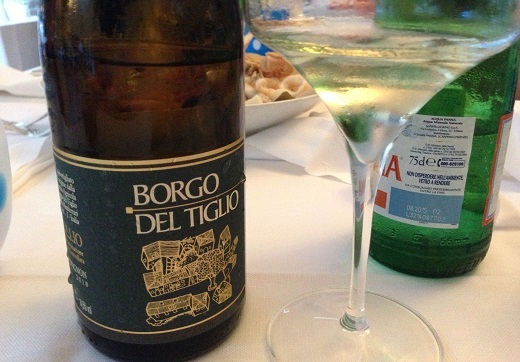 Nevertheless, we are lucky, if that is the right word, to find the last bottles of two wines from Borgo del Tiglio. The 2010 Chardonnay is drop-dead gorgeous. 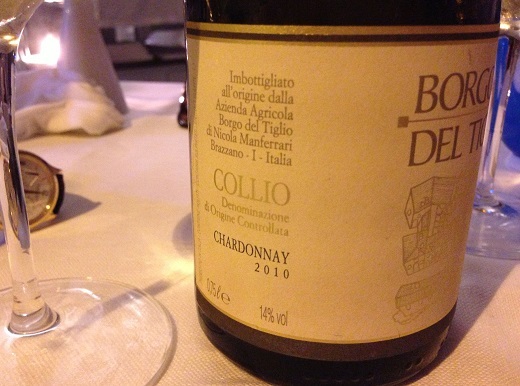 An intensely mineral, saline wine, the 2010 bursts from the glass with a compelling array of Collio-inflected aromas and flavors. It is a great match for the food. Even better, the 2010 Sauvignon Selezione, is flat-out stunning. Expressive varietal aromatics, meld into rich white and yellow stone fruits in another wine loaded with energy and mouth-watering, salivating acidity. Readers visiting Grado should definitely stop by all’Androna. The food is fabulous and the outdoor seating during the summer months is a pure delight. When it comes to wine, the best approach is to not expect much. Who knows, you might be pleasantly surprised.